A form-fill-seal machine (form, fill, and seal), which uses a scale to weigh the amount of product to be inserted into the pouch. (See Scale Equipment). Form-fill-seal (form, fill, and seal) machines form a pouch from a flat web of film of heat sealable film and insert product into the pouch before sealing the pouch. Horizontal form-fill-seal machines fold incoming film in half length-wise. Form-fill scale machines then seal and cut the sides of the pouch to a specific length. The two side seals and the bottom fold forms an open top pouch. The pouch is then filled and the top opening sealed. 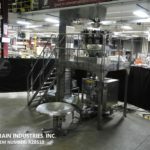 Vertical form-fill-seal machines wrap incoming film around a tube. The two edges of the film are sealed together to form a tube of film. The bottom of the tube is sealed, the product is filled into the pouch, and the top of the tube of film is seal and cut from the rest of the tube of film. Ohlson Model VFFX-539, automatic, stainless steel, continuous motion, vertical form, fill, seal machine. Rated from 20 to 100 bags per minute – depending on materials, application and machine configuration. Bag size range: 3" to 9" in Width; 2" to 11" in length with proper change parts. Equipped with 10" wide seal jaws and 11" long lap seal, with dual side film assit belts, film detection and tracking, registration film advance and servo drive motors. Maximum film roll size: 15" OD x 19.5" Wide. Touch pad controller and E-stop. Mounted on stainless steel base frame with interlocking Lexan guarding and leveling legs. 60" long incline cleated discharge conveyor has 10" wide white flex link belt with 1" high lugs on 9" centers and 46" OD stainless steel disc accumulator both with start, e-stop push button controls. Automatic, servo driven, intermittent motion, horizontal, f/f/s with stainless steel bucket elevator, platform with stars, 14 head combination scales. Speeds 10 to 70 ppm depending on material and application. Has a chain pouch feed conveyor with 20 stations set on 10" centers with adjustable forming plow, powered film unwind and 9 1/2" H tension rollers, side seal, and cut-off stations, no pouch detection, suction cup style pouch opener, Top seal cleaning, heat seal bar, and pouch pick-off, can handle a 18" OD max film roll, with 26" max web width, and 3" OD core. Electrically interlocked guards, servo drive, A/B SLC 5/04 PLC with swing arm, touch pad controls, and 550 panel view. Complete form fill and seal line, that is mechanically and electrically integrated. Bulk vibratory feeder, into bucket elevator, into a vibratory feeding conveyor that is on demand for the Ishida 14 head dimpled scaling system, mounted above a Bosch SVB 2500 form fill and seal with dual mandrels, power film unwind, film registration, vacuum side belt pull down, horizontal and vertical seal, and "V plate" pouch support. Bags are conveyed away by a incline cleated take away conveyor. Equipped with mezzanine, guard rails, and stairs. Viking, Model E250, complete vertical form fill and seal system. Rated from 10 to 60 cycles per minute – depending on materials, application and machine configuration. Bag size: 2½" – 15" long x 2½" – 10" wide. Film Roll size: 21" wide max. Equipped with a bucket elevator feeding into a 12" wide x 30" long vibratory product feeder, 10-head Yamato scale with dimpled buckets, Lock Met 30+ 8" diameter flow thru metal detector, 18" long x 1¾" wide fill tube, 16" long lap seal bar, 11" wide hot serrated knife seal jaw, film registration, Markem SmartDate x40 coder, 10" wide x 18" long product discharge chute with 11" ground clearance and controlled by a touch screen panel. System is mounted on a painted mezzanine. Triangle Model S6CF4, automatic, vertical, stainless steel, form, fill, seal machine with 6 lane linear scale system rated 10 to 50 bags per minute – depending on materials and application. Bag size range: up to 8" in Width: up to 14" in Length. Equipped with Selectacom 6 head, linear combination weigh scale system, has 6 accumulator and 6 weigh cell buckets 6" long x 4" wide and 12 portion weigh buckets 7-1/2" long x 4-1/2" wide, maximum weights up to 20 lbs. 9" horizontal seal jaws with 14" long lap seal and film registration. Control panel has touch pad controller with LED readout, start / stop, heat seal jaw, registration, no bag / no fill, sensor, temperature and scale controls with e-stop. USDA – 3A approved. Film specifications: 24" wide roll; up to 16" in diameter. Automatic, intermittent motion, vertical, F/F/S rated 10 to 60 bpm – depending on materials and application. Bag size range: 3” to 8" in Width; 3” to 16” in Length. Equipped with 9" long x 2" wide hot knife horizontal seal jaws, 16” long vertical lap seal, film registration, no bag / no fill sensor. Scale: Triangle Selectacom 21- 6/12 double head linear combination scale system with 6" x 4" stainless steel buckets. Film Spec: 24" Wide film rolls with max 16" diameter web.